Once Upon a Book Club is a uniquely engaging book subscription box. Instead of just sending along books and bookish items, this monthly subscription box sends you one book and a series of individually wrapped items, each with a numbered tag that corresponds to a page in the book. As you read, you open the items that correspond to the page numbers, unwrapping gifts that help bring the story to life. Remember, wait to open each gift until you hit the right page number. It’s hard to wait, but it’s way more fun to play along! The info card for the Once Upon a Book Club box features a beautiful print of a quote from the book. On the flip side, there’s a series of discussion questions. Once Upon a Book Club uses their Instagram account as a platform where members can connect and talk through these points. I appreciate that they put energy into making their subscription program a legitimate book club community! I love the warm, magical artwork on the front and back covers. Because of the nature of this box, there might be some book spoilers from here on in. I’ll try to tread lightly, but FYI! The first item came wrapped in pretty pink paper. This is one of the only gifts you’ll see for awhile—most of the gifts are for the second half of the book. Cigar Box & Postcard – Value? Inside the paper is this vintage-inspired cardboard cigar box to match the cigar box that belongs to one of the protagonists of the novel. Inside the cigar box, there’s a postcard printed with the faces of the Ringling brothers, of circus fame. This gift comes at a time in the book when a protagonist meets one of the Ringlings, beginning generations of adventures that fill the novel. It’s a pretty box—I know folks use these for storage (it’d be great for jewelry or stationery), but I might use it as a clever way to wrap a gift! That very vintage style isn’t quite me, but if it’s yours, you could totally frame the postcard and use it to add some turn-of-the-century character to a corner of your home. Metal Pocket Watch – Value? Aha! It’s heavy because this metal pocket watch is inside! I don’t think this watch is made of anything sophisticated, but the vintage finish gives it a classy appeal. With most pocket watches, you squeeze the button on the top to open the cover. In the case of this watch, you just kind of unsnap it manually (it closes pretty securely, but you can pop it open easily, too). The best part is this quote on the back, which is framed by a twisting pattern with playing card suits nestled inside. The watch isn’t the highest quality (it’s a little rattle-y), and it’s not quite my style, but I appreciate the detail put into this piece. It goes right along with the mention of a pocket watch in the story, too. Seeing it come to life in front of you is pretty cool! Next up is this little red box. Isn’t the twisty, twirly Once Upon a Book Club font cute? I like seeing it used throughout this box. Rhinestone Hair Clip – Value? In the pages leading up to this gift, two characters discuss the thimble as a symbol of whether a woman was married or not. If you’re not familiar with the details of a thimble (I’m definitely not), it was helpful to see this little reminder. The rhinestone hair clip is pretty—I could see wearing it on a fancy night out. It’s something a protagonist wears, too, so it’s a neat, personal connection to a character. This envelope has been tea-stained, so that it has the weathered look of a circus tent. This piece arrives when a character opens a mysterious note with a shred of her costume inside. A threat? That’s for you to find out, dear reader! And indeed, inside this note, there’s an index card folded around a bright yellow shred of fabric. It’s not the most exciting gift, but it does correspond with the story nicely. The final gift looks to be a poster held tight by a hair band. The hair band has a little bow with circus-esque yellow and red stripes. Finally, this little bag of Cracker Jack is included, with a “Sorry for the Delay!” sticker on it. I love Cracker Jack, which is sweet and savory caramel popcorn, so I’ll take it! Verdict: While I love the idea behind Once Upon a Book Club, I wish the items had a bit more practicality beyond their relationship to the story. The pieces all coordinate nicely with the book, really bringing the magical story to life. Minus the price of the book, the box is about $25, meaning the five gifts must each average around $5. That’s probably accurate, but for things like the fabric in the envelope and the prints/postcards, which are probably under $5. The items seem custom-made for the box, though, which gives them some additional value. Plus, as mentioned, they do their job in making the book come to life! 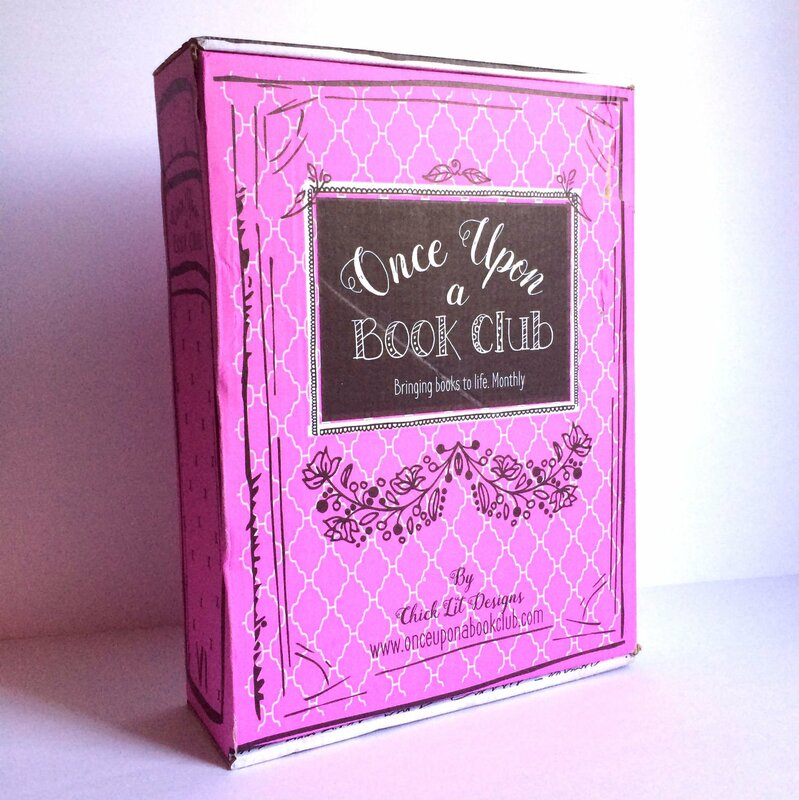 What do you think of the items in this Once Upon a Book Club box? How would you use them? I got this box too and do wish the items would have been a little more useful. I can’t wait to read the book though, it looks really good!